The Nissan GT-R tops the list of cars most expensive to insure. Beating even the Dodge Viper. Topping the "most expensive to insure" list is the Nissan GT-R, which Nissan bills as a "multi performance supercar" that delivers fantasy driving. Its average annual premium is $2,533. Compare that price to the lowest-premium vehicle, the Hyundai Santa Fe at $832, and you can see how your car choice can deliver a surprising insurance bill. 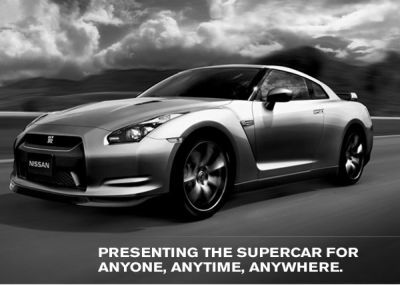 The GT-R's supercharged engine helped drive it to the top of the list. It's a 3.8-liter twin-turbocharged 24-valve V6 with 485 horsepower. Compare that to the Honda Accord Coupe EX-L V6, with a horsepower of 271. Or take the Smart Fortwo, the smallest car available and one of the least expensive to insure, which has 71 horsepower. Owners of the GT-R buy it for power and speed, and their driving habits are often reflected in frequent and expensive insurance claims. GT-R owners who are young with less-than-spotless driving records could easily see their annual car insurance premiums zoom to several thousand dollars. Sports cars dominate the "most expensive" roster, along with theft favorites like the Cadillac Escalade. If low premiums are more your speed, the "least expensive" list contains a good selection of SUVs, minivans and passenger cars. Low insurance rates tend to reflect a vehicle's safety because drivers of those models have submitted fewer and less-expensive insurance claims.